In the Oscar-nominated Slumdog Millionaire (2008), characters seem to carve their own trajectories through Mumbai space. Director Danny Boyle follows the film's titular hero, Jamal (Dev Patel) as he grows up. Scenes that take place during Jamal's childhood show an overwhelming horizontality: along with his brother Salim and future romantic interest Latika, Jamal moves left, right, and in some instances even relies on railroads to move from place to place. If this is not a cartographic understanding of the cinematic spaces, then at least there is an effort to depict something of a flattened, isotropic space. But it is only a general flattening, as the detritus and conurbations of everyday life seem to add some relief to the images of Jamal's youth. At first, the only sense of verticality comes via various establishing shots showing Mumbai's various urban fabrics. These are not necessarily associated with Jamal's own world view. This changes once he grows up. The call center where Jamal worked is depicted from the above. The camera seems to hang from the rafters, showing a dense agglomeration of computer terminals and workstations. In a poignant scene where Jamal meets his brother-turned-gangster for the first time in a very long time, Boyle shows them meeting in an unbuilt apartment building. Poured concrete floor plates literally frame a view of Mumbai. At one point, Salim points to the city beyond and below this concrete framing. High-rise towers rise from the site of a former slum -- the very place where Jamal and Salim grew up. Salim refers to this vista as the "center of the world." This view from above thus creates a physical and metaphorical distance. Salim has risen above his life of poverty and can now look down on the city that rejected him at first. This viewing from above is a familiar trope, in both architecture and film. Salim's own sentiments echo Le Corbusier's exhortations from Aircraft (1935). 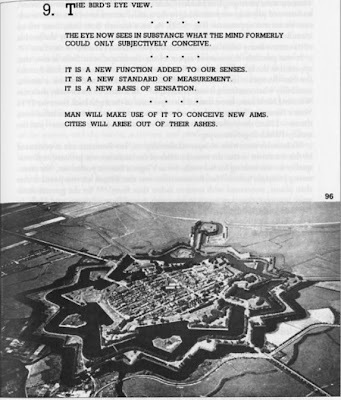 In that book, an aerial view of a premodern fortification suggests how "the eye now sees in substance what the mind formerly could only subjectively conceive." Altitude, whether sensed from an airplane's cramped cockpit or the vertiginous height of an unbuilt skyscraper in Mumbai, gives cause for critical reflection. It also affords new opportunities. So says Le Corbusier: "Man will make use of [the bird's eye view] to conceive new aims. Cities will rise out of their ashes." Yet Salim's and Jamal's birds' eye views of Mumbai from Slumdog Millionaire problematize Le Corbusier's sentiments. Temporality seems to defeat any of the advantages of altitude. After all, Jamal and Salim are still young. Now high above their former slum, they realize that it was not too long ago when they were still moored to it physically. The bird's eye view reminds the protagonists all too well of their past. If such a view, as Le Corbusier states, leads to cities rising out of their ashes, it follows that the film's protagonists may not necessarily be able to rise above it all. The view of Mumbai from above is, as Moholy-Nagy would put it, a "space compressor", an extension of vision that collapses air and ground. This collapse gives only a representation of altitude. But for Jamal and Salim, it is a false altitude. This scene inside the unbuilt Mumbai tower evokes another image of children unable to escape from their urban environs. 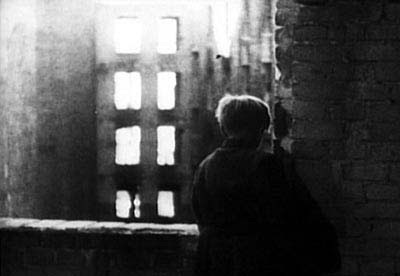 In a famous sequence from Roberto Rossellini's Germania Anno Zero (1948), a young German child (Edmund Moeschke) retreats high into a bombed-out building and looks out at the destroyed city below. From this vantage point, Berlin's streets are clogged with brick, dirt, and mangled iron. After the child surveys these scenes, he stands looking at a building across the street. With the camera directly behind the child, there is no sense of distance. It is as if the remains of another bombed-out building were pushing up directly against the child's face. Perhaps this is why he grabs on to wall next to him. He tries to avoid the oppressive sense of destruction. His only recourse is to look away from the destroyed building and look down at the street. Like Jamal and Salim in Slumdog Millionaire, the child from Germania Anno Zero is unable to escape the ground below. This is one of the most-interesting pieces on Slumdog Millionaire (there are a lot, and most are dull!) that I've had the pleasure to find and read. Coincidence: I watched Germany, Year Zero for the first time a few weeks ago. Maybe a key difference is in the buildings? In Germany, the building from which the little boy watches is one in the midst of destruction; in Slumdog, the building is one that's being constructed. If the German boy looks out and sees pain and suffering on the ground, perhaps he feels that no matter how high he climbs, the building on which he stands will eventually crumble to the misery and streets below. There is no escape. Hence, he jumps. In Slumdog, on the other hand, maybe the feeling is of rising, of creation? Looking down, Jamal senses that he's on new and stable "ground", and that though poverty remains below, he's no longer in danger of falling back into it. very well written, the writing is able to build a framework for the film that generates a dialogue...rather than subjective criticism. I find your observation to be even more interesting given that the final built products of the 2 visions (corbusier's Ville contemporaine and the developer's in Bombay) is more or less the same but when put against the backdrop of the difference in the global economies one realises that the 2 visions actually strike a dialectics with each other and still manifesting the same product! skyscrappers within gardens.